The lymphatic system is one of the organs that is present throughout the human body and consists of lymph vessels and a number of organs. The lymphatic system produces and transports white blood cells. Additionally, it serves important immunological functions such as transporting protein, fat, and water through lymphatic system. The lymphatic system identifies and responds to cancer cells, foreign cells, infections, bacteria, surgery, and trauma by producing and transporting white blood cells. It is estimated that in the United States alone, 3-5 million people live with some form of lymphedema. Of that, around 480,000 people suffer from breast cancer-related lymphedema. Risk factors for developing lymphedema include, gaining weight/being overweight, infection in the affected limb or body part, cancer and radiation therapy. Breast cancer is the most common cause for secondary lymphedema. Removal and/or radiation of lymph nodes and damage to lymph vessels are the primary causes for lymphedema. Complete Decongestive Therapy which includes Manual Lymphatic Drainage (MLD) and compression. MLD is a gentle, predominantly circular stretching of the skin which promotes movement of fluid in the desired drainage direction. Talk with your primary care or treating physician if you have questions or concerns. If you are diagnosed with lymphedema, your physician may refer you to a CLT. The initial evaluation may include gathering information and measurements of your range of motion, muscle grade, limb circumference, sensation and activities of daily living. 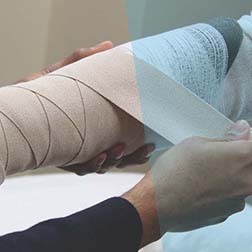 Best practice for lymphedema treatment is recommended 5 days per week for a period of 4-6 weeks targeting MLD along with compression bandaging. By the end of the third or fourth week of treatment, limb measurements for compression garments (sleeves, stockings) will be taken. By the end of the fifth or sixth week of treatment, the client will be trained in putting on and taking off the compression garment(s). Regular follow-ups with a CLT are recommended every six to twelve months.